A complication of measles that kills children years after they have the infection is more common than thought, according to a study being presented at IDWeek 2016™. The research underscores the vital importance of herd immunity by vaccination: All who are eligible should be vaccinated to protect those who can’t be immunized, including infants. Subacute sclerosing panencephalitis (SSPE) is a neurological disorder that is 100 percent fatal. Infants younger than 12 months, who are too young to receive measles, mumps and rubella (MMR) vaccine, can get infected with measles and later develop SSPE, which may lay dormant for years. 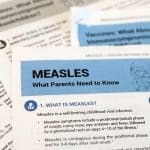 While it was once thought the risk of post-measles SSPE was one in 100,000, recent research identified a rate as low as 1 in 1,700 in Germany among children infected with measles before they were 5 years old, and the new study found it is about one in 600 for those who get measles as infants before being vaccinated. There is no cure for SSPE and the only way to prevent it is to vaccinate everyone against measles. Researchers identified 17 cases of SSPE in California between 1998 and 2015, all of whom had measles prior to being vaccinated. Although all got measles as children, SSPE did not develop right away: The average age at diagnosis was 12, but the range was from 3 to 35 years old. In a subanalysis of California children who got measles while living in the United States, 1 in 1,387 who got it younger than 5 years and 1 in 609 who got it younger than 12 months developed SSPE. Many of these patients had ongoing cognitive or movement problems before they were definitively diagnosed. A majority of the children (67 percent) were living in the United States when they got measles. Measles infection causes fever, runny nose, cough, red eyes, sore throat and rash. The virus spreads throughout the body and is cleared within 14 days. In rare cases the virus spreads to the brain, but then becomes dormant. Eventually it can lead to SSPE, resulting in deterioration and death. Researchers don’t know what causes the virus to reactivate. Vaccinating a very high portion of the population ensures herd immunity, meaning even those who can’t be vaccinated are protected because the disease is less likely to spread. The MMR vaccine isn’t recommended until infants are 12 months old because they retain some of their mother’s antibodies until that age, making the vaccine less effective, but leaving them vulnerable to measles. Others who can’t get vaccinated include those with immune system disorders. The first dose of MMR is given between 12 and 15 months old. Because there is a 5 percent vaccination failure rate, a second dose is given to children before they begin school. Measles is so contagious that 95 percent of people need to be vaccinated with two doses to protect those who aren’t, said Dr. Cherry. Therefore, all who are eligible – including adults who had not previously been vaccinated – should receive two doses of the vaccine. Nearly 92 percent of U.S. children 19-35 months old have received the MMR vaccine, according to the CDC.